Special St. George District and Subdistricts. Special St.George District and Subdistricts used with permission of the New York City Department of City Planning. All rights reserved. Council okays creation of Special St. George District to revitalize waterfront neighborhood. On October 23, 2008, the City Council approved the Department of City Planning’s rezoning proposal for St. George, a densely populated neighborhood located at the northern tip of Staten Island. 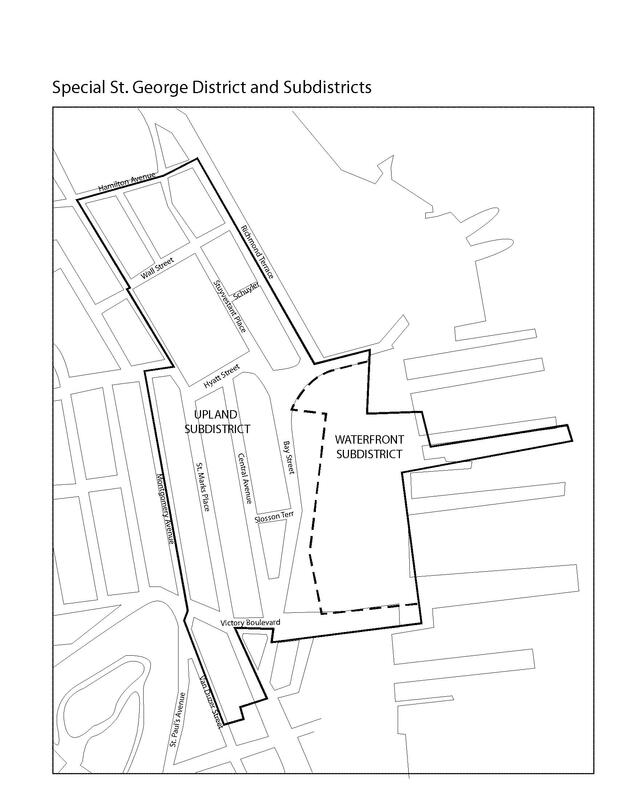 The proposal builds upon interim rules, implemented in 2005, that were designed to curb out-of-character townhouse development in commercial districts. The rules, as applied to St. George, prohibited residential uses on ground floors and limited residential buildings to heights of 70ft. Though townhouse development declined after the rules were implemented, vacant office buildings still plagued St. George’s C4-2 district. In an effort to encourage reinvestment in the area, City Planning created the Special St. George District for 12 blocks, encompassing the civic and commercial area of the neighborhood. The Special District seeks to promote the re-use of vacant buildings, bolster a pedestrian-friendly mixed-use district, and encourage the construction of taller, narrower buildings that preserve waterfront views. To promote retail continuity in the area, sections of certain blocks have been designated as “commercial streets,” requiring retail and other commercial uses for ground floors. All new construction throughout the Special District must provide sidewalks that are at least 12ft. wide to support pedestrian activity. To prevent out-of-character growth in the new St. George, FAR has been equalized to a maximum of 3.4 for all uses, except for lots smaller than 10,000sq.ft. located on noncommercial streets, which have a maximum FAR of 2.2. The rezoning permits the construction of “point” and “broad” towers in portions of the Special District, but requires that the narrow portion of the building face the water to protect views of the harbor. Also, to promote a more aesthetically pleasing environment, open parking lots are prohibited on commercial streets; however, to ensure adequate off-street parking, parking space within structures will not count toward floor area. At least 40 percent of garage rooftops must be landscaped as well. At the Council’s Zoning & Franchises Subcommittee hearing, opponents of the plan were concerned that the rezoning would not be progressively phased-in. In light of the recent economic downturn, a slow phase-in, targeting the areas with vacant office buildings, would ensure that conversion of these buildings into residences would occur first. The opposition also stated that a maximum width of 80ft. and depth of 135ft. will result in some towers built too large for the existing neighborhood. The Subcommittee approved the rezoning plan without change. Council Member Michael E. McMahon, whose district includes St. George, explained his vote, stating, “I think this is an imperfect plan, but I don’t think perfection should stand in the way of progress.” The Council’s Land Use Committee approved the plan, and the full Council followed suit. Council: St. George Rezoning (Oct. 23, 2008).